The MVWC7ESWW washing machine from Maytag is best known for its energy efficiency and water-saving features. It is manufactured using the excellent Maytag Commercial Technology. Its width is at 27 inches, depth at 25 and ½ inches, and height at 43 inches. With incredible features such as the 3x3 Spray System, auto load sensing, and 2-speed motor, any home can benefit from having the MVWC7ESWW top-load washer from Maytag. - It is ENERGY STAR-qualified. - It is manufactured using the reliable Maytag Commercial Technology. - The 4.0 cu. ft. capacity can accommodate large laundry. - It comes with the auto load sensing feature. - The 3x3 Spray System allows for thorough cleaning. - The bleach and fabric softener dispensers let you enjoy easy washing. - It comes with a 2-speed motor. - It uses a commercial-grade wash basket made from high-quality stainless steel. - It comes with an extra rinse option. - it has 640 RPM maximum spin speed. - It comes with 5 speed combination. Energy Star-qualified and available in 4.0 cu. 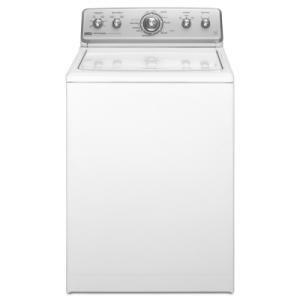 ft capacity, this top load washer from Maytag can accommodate heavy loads and help remove tough stains. Using premier Maytag Commercial Technology, this washer comes with commercial-grade components such as a stainless-steel wash basket, 2-speed motor, and commercial-grade glass window lid. Clothes always come out clean and fresh smelling with the 3x3 Spray System feature. Also, with the washer’s shatter resistant glass window lid, you can easily monitor your laundry anytime needed. There are separate bleach and fabric softener dispensers, and you can choose whether to add the fabric softener to your laundry or not. The extra rinse option is also available if you want more thorough cleaning and rinsing. There are four different temperature settings for different types of laundry. This washing machine also comes with an IntelliFill Automatic Water Level Sensor and Automatic Temperature Control. . This machine is both functional and easy to use, making it an important addition to any home. Its transmission drive shaft, spin gear, and synthetic oil have all been tested to be twice the life of ordinary washers. There are some disadvantages that come with a top-loading washer. With the Maytag MVWC7ESWW being a top load machine, some users may have a few issues with its functions and features. Since most top-loading machines use up more water than its front-loading counterparts, this washing machine may not be for you if you are trying to save up on water consumption. Also, the maximum spin speed is set at only 640 rpm. I wish that I would have investigated the consumer reports prior to purchase. I generally do so before making a major purchase, but I relied on the Maytag reputation. In retrospect, I can see that my perception of their reputation is clearly outdated. I thought their products lasted for years based on my family's use of Maytag products purchased prior to 10 years ago. The agitator on my machine is already defunct and I have had the machine for only two years. I will never purchase a Maytag product again or trust Home Depot. I had the ability to purchase from Costco initially because they will stand by the products they sell. Home Depot has the added advantage of selling many more appliances and they probably knew of the issues with regard to these "total lack of quality products. I can hardly wait to see if anyone can actually fix the machine. Our washer is a Maytag Centennial which was purchased 17 months ago. Within the past few days it has started making a very loud noise and this morning it left each towel weighing about 10 pounds each since the spin cycle did not remove the excess water. I haven't called yet to service it but can't wait for the experience. My parents had Maytags and the one we had up until purchasing this one was inherited from them in 1987 so it really did last a long time. We never had a problem with it in the 25 years we had it. Just thought it was about time to get a new one. Bad mistake. I have this Maytag centennial washer, do not buy this machine if you want clean smelling clothes. I was very loyal Maytag customer and bought this machine in November 2011. Flash forward to February 2013 and it is broke (control panel) with a repair estimate totaling almost as much as the original cost. My household generates a lot of laundry but I am very respectful of my appliances; I used only HE detergent, didn't overload, ran the cleaning cycle with the afresh tablest every month, etc. and still I find myself having a washing machine that is quite simply a piece of junk. Literally. Save yourself the time, money, and headaches that I and others have endured. Do not buy this machine! For those who care, suffice it to say I will not be buying another Maytag. The clothes come out dripping wet and it takes 2+ hours to dry them. No amount of draining and spinning makes a difference. I had bought my washer in Oct 2011, stopped working, piece of junk, do not buy, I bought extended warranty, so thanks to that, all the cycles on the machine stopped working , would only catch water and drain, nothing else. Please do not buy!!!! all the people that bought this washer. I am an appliance technician and the majority of new HE washer complaints can be solved with customer education. Since less water is being used, even the soap manufacturers are telling you to use too much soap. Only use 1 to 2 TBSP's of soap!!! Always wash like items together, to allow for proper balancing. On front loaders, only fill with 1/2 to 2/3 basket full of laundry also to allow for proper balancing. Top loaders need to be set around the agitator, not on it. Liquid fabric softener should be mixed 50/50 with water to properly distributed in the rinse cycle. A little bit of care on your part will save aggravation in the end. Even though HE detergent and fabric softener costs more for the bottle, just remember that following my recommendations will make your bottle last longer. Every month, a cleaning of the basket/tub should be done, either with bleach, a cleaning product like Affresh or Tide Tub cleaner. Keep your lid/door open and your dispenser drawer on the front loaders open for air circulation to allow the water to evaporate and not cause an odor in your washer. Always purchase an extended warranty, with an annual maintenance and cleaning package included. The technician can refresh your memory on what to do and also may catch a problem prior to it becoming an issue. I bought a top loading Maytag washing machine last year and I hate it! The water sensor is supposed to save water but it doesn't even fill enough to let clothes swish around to get clean. I tried very small loads, medium loads and larger loads and have the same problem. I just got so aggravated because I just went to transfer some jeans from the washer to the dryer and they were still dirty (food spills, nothing major) It looked like they got barely wet and definitely didn't get clean. I just re-Shouted them and am not rewashing them along with another item that was still dirty. This happens all the time - same types of items/dirt that I was previously washing in my older Whirlpool with no problem. Also, even with the extra rinse, the drain is still filled with suds (I am not using too much soap) and sometimes the clothes still seem a slight bit soapy. It is very disappointing! My mom bought same washer and has same problems! I've had my maytag washer and dryer for about six months, the worst applicances I've ever owned. If you fill the washer, the clothes does not clean; sometimes a second wash or fill it half full. They get wet and that's it. On the 70 minutes timed dry, it takes 140 minutes to dry one load. i purchased a maytag at wall mart in july 2010. Its already giving me problems it starts washing before the water level cycle is complete, and spins before the spinning cycle ends. the machine starts pouring water, and the clothes get soaked making them impossible to put it in the dryer. Thank you for your comments. I was just about to buy this and I SHALL NOT. Maytag lost a sale. My machine is less than 2 years old and the automatic water level does not work. It fills up the whole way to wash a small load of clothes. Obviously this does not save any water. I agree with others and will never buy the Maytag brand again. I agree, bought maytag because of the great reputation and boy was I wrong!! I guess I should be happy because ours lasted 5 years to the month. Then the bearings broke and the cost of fixing was more than its worth. It does fit alot, but the maytag name is now worth TOTAL crap. when I called the company they simply said that some washers last longer than others. Im sorry - but my parents have had basically the same model for 20 years with no problems EVER. A washer should last 20 years at the least, not 5!! Got mine just over a year ago. Just a week or so out of warranty and it is no longer working. I bought Maytag because of it's reputation but never again. My daughters Maytag set is ten years old, and still functioning great. The newer Maytag is not worth fixing. I called the service department who will send a diagnostic tech out for $50, then they will send a repairman out and of course the parts. Just not worth repairing. I agree totally with the consumer that submitted the Oct. 2010 comment. I now have owned my machine 12 1/2 mos. Thank God I have purchased the extended warranty, but why should I have to do that for what I consider a brand new machine?!! I looked this up on the Maytag Website before coming to this website and I can't even find the machine on there!! No wonder, it's a piece of junk! I have had the switch replaced in one repair, and the timer in another. Now I am waiting almost a week to have their repair guy show up to hook up his little computer and tell me what's wrong with it again. It stopped in the middle of washing and has a burnt rubber smell. Besides that, the automatic water sensor does not give it enough water to wash in. I know----I have peeked, (which you're not supposed to do)The clothes were only halfway covered in water. No wonder it saves water!!! There is no way to override this feature to adjust the water level. Piece of crap!!! Would Never Buy Maytag Again! I bought the Model #MVWC6ESWW from Home Depot on 8-25-10. It was delivered to my house on 9-4-10 and it broke down on 10-4-10. I worked for exactly ONE MONTH. It is a piece of JUNK. I would never buy a Maytag product again, nor would I buy anything from Home Depot again. I was told by both a sales rep and a manager at Hoem Depot that, "once you sign off on the applicance when it's delivered, it's your and Maytag's problem, not ours." The repair person is coming in a few days for the THIRD service call. First the water was not running into the machine; the repairman put it in a new part; went to do laundry the next morning, and the rinse cycle no longer works. This piece of junk keeps getting worse and worse. Maytag is of no use whatsoever. All they told me was, "that's what your warranty is for." They must not have very much faith in their products if they tell you you have to rely so heavily on the warranty! When a machine has this many problems after only ONE MONTH, it strongly sends a message to me that this machine is a LEMON with serious problems and it will never be right. I was told by Maytag that the only way they will replace this machine is if a repair person deems it "non-repairable." It's not like this machine was overused in that ONE month that it worked. There are only 2 adults people in the household. I will NEVER but a Maytag product again, nor would I ever recommend that anyone buy one of their products. This washing machine is a total nightmare. Oh, and they're quick to tell you that they will not reimburse you the money you lose from having to take off from work to sit and wait for the repair person, nor will they reimburse the cost of going to the laundermat. HORRIBLE WASHING MACHINE -- HORRIBLE CUSTOMER SERVICE. I bought this washer from home depot about 3 weeks ago and I have washed numerous loads since then. It does a very good job cleaning my cloths. The tub is deeper then my old Maytag (which I had for 22 years)so I can wash more clothes at a time which saves time, soap and water. It is very quiet and does not take very long to wash a load. I would recomend this machine to anyone. The high efficency machine requires HE detergent which costs a little more but uses less detergent so it comes out to be about the same.